Size: Mouse pad is 9*7 inches, about 190x250x5mm. 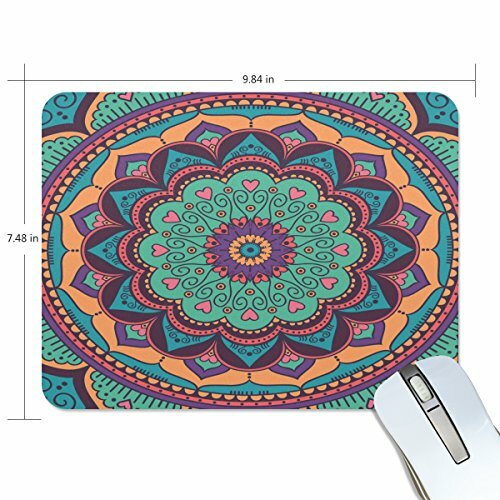 Material: Mouse pad is made of soft ,durable and non-slip rubber, polyester fabric top. Design: Unique design printing will decorate your desk. Works perfectly for all mouse types. Gift idea: The mouse pad will be a good present for your family, friends, teachers etc. Best service: We offer the best service. If you're not completely satisfied with your purchase, simply let us know and we will give you a full refund within 30 days. Many people use mouse pad every day. A good and pretty mouse pad will bring some different for your life.